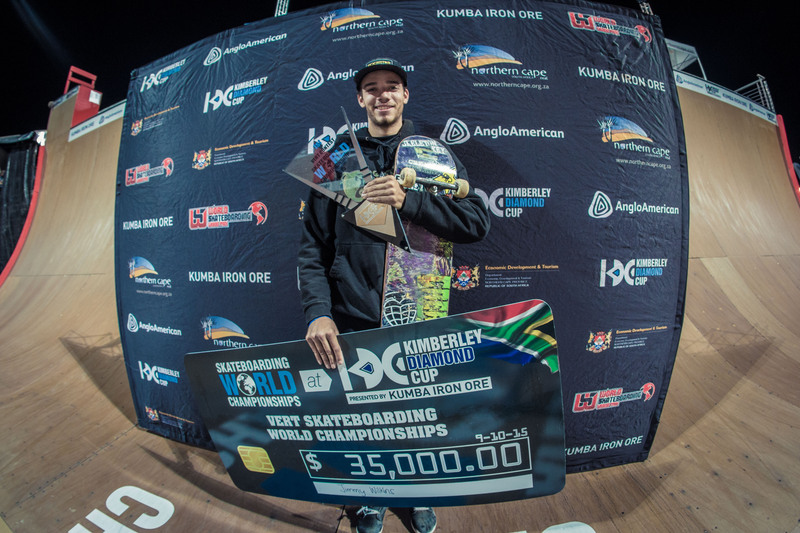 (Kimberley, South Africa – October 9, 2015) – The Skateboarding World Championships at the Kimberley Diamond Cup moved into day two with the Rider Cup Team Championships, the qualifiers for Saturday’s Street World Championships and the Vert World Championships. Jimmy Wilkins defended his title as the Vert World Champion, earning him $35,000 cash. Mitchie Brusco placed second and Pierre Luc Gagnon finished third. The Street World Championships will be held Saturday at 10 a.m. PDT/1 p.m. EDT and broadcast live via SuperSport in 49 countries and webcast on www.kimberleydiamondcup.com. The Skateboarding World Championships are sanctioned by the World Skateboarding Federation, a governing body for skateboarding. WSF provided financial assistance to over 50 skaters to help them pay for travel expenses to South Africa.